Locate a Nord at Gnoll Mountain, said to be running from a fate he chose in Solstheim. Today it will find him. Make your way up the mountain to Hoar-Blood. Decide how you will kill him and his wolf companion. Make your way to the next dead drop. Your orders instruct you to travel to Gnoll Mountain to kill Havilstein Hoar-Blood. According to the dead-drop orders, he murdered a mead hall chieftain back on Solstheim and the victim's sister wants bloody revenge. This is out of the ordinary, as Nord tradition dictates some form of material compensation. 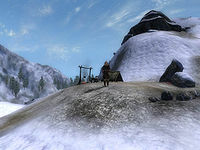 Travel to Bruma, you then need to head directly east to Gnoll Mountain. The easiest way up the mountain is the trail. Follow the trail that starts at the Bruma East Gate. Take the left path when you get to the "Bruma-Imperial City" crossroads. Take the first right when you get to Dragonclaw Rock. You'll run into a Bandit camp very shortly, so be ready. Continue east past the camp. Now, head up the mountain and across the bridge. Hoar-Blood and Redmaw (his wolf companion) can be found at the end of the trail. If you have the Wizard's Tower official plug-in, you can fast travel to Frostcrag Spire and follow the road away from it. From here, it is not a far walk to Gnoll Mountain. Similar to your other targets, Havilstein is well equipped, with an almost full set of leveled light armor, and a leveled battleaxe, which is usually enchanted. He never eats, so no use of poisoned apples this time. He does sleep though, so you can approach him at night for an easy kill. If you're still having trouble with executing him, remember the terrain you're fighting in; the steep Jerall Mountains allow for painful fall damage, or try getting him in a place where he will be unable to easily reach you. Now that business has been taken care of, you should head for Nornal to collect your reward/next contract. The ruins are filled with rats, crabs and marauders, this doesn't change if you're higher than level 5. Upon entering, head down the stairs and take a right. Dive under the water and swim towards the door. It's locked. There exists A Rusty Key, that opens the lock, if your security skill isn't that high. However, an alternative way of entering the room is to use a potion or item that gives you "Water Walking on Self" and walk through the iron bars above the door, effectively bypassing the gate. In the chest is your gold and your next contract. You could also just jump out of the water to get over the gate. 10 I have picked up my next contract from the dead drop in the hollowed-out tree stump. I have been ordered to go to the campsite on Gnoll Mountain and kill Havilstein Hoar-Blood, a savage Nord Barbarian skilled in the use of the axe. 20 Havilstein Hoar-Blood is dead. I must now pick up my reward and next contract at the dead drop located in an old chest that is sunk into the pool at the Ayleid ruin of Nornal. It is possible to use the console to advance through the quest by entering setstage Dark15Coldest stage, where stage is the number of the stage you wish to complete. It is not possible to un-complete (i.e. go back) quest stages. See SetStage for more information. Esta página foi modificada pela última vez à(s) 01h42min de 14 de dezembro de 2013.